It is a shame I didn’t get a shot of a slice of this cake. I could have, should have, but I didn’t. Sorry about that. If I had, you would have seen the glorious tight and dense crumb. In my opinion, it is a tight and dense crumb that makes a pound cake great. That and lots of butter. This recipe comes by way of a memoir. Normally, I am a little suspect of recipes in memoirs (unless we are talking about a food memoir like Cooking for Mr. Latte or A Homemade Life). My thoughts are along the lines of “who is this person and why does he/she think she can just include a recipe at the end of each chapter?” My friend Cheryl gave me a copy of Cakewalk last summer and it has been sitting on my “to read” pile for far too long. It is the story of a very interesting and troubled family. It is well-written and although food is not the subject, the author does write about tantalizing treats. Many of the end-of-chapter recipes spoke to me but I made this one because I had all the ingredients on hand. Sometimes I just want to bake. If you like to bake, I’m sure you are familiar with this feeling. For me, it isn’t even so much for the end result although ending up with a homemade baked good is nice. Sometimes it is just the act of pulling out the flour and sugar, turning on the mixer, preheating the oven, anticipating the smells that will soon perfume my house… When I just want to bake, I don’t want to fuss. Cookies are too much trouble – all that shaping and switching baking sheets in the oven. This is why I love simple cakes. I did a little dessert party last night – a reception for a very moving play currently running at the New City Theatre in Seattle. Sick tells of one woman’s struggle with pain and medication and the cracks we can all fall through in the American medical system. You can read more about the play here. Randy and I wanted to support the playwright and actress and we decided to invite some of our friends to attend. We lured them with the promise of a compelling story and with treats afterward. I made butterscotch pudding tarts and chocolate friands (recipes coming soon). I made the most favorite chocolate chip cookies. But several people pulled me aside to tell me this cake was their favorite. It is comfort food at its most comfortable. And the glaze! Swoon. You can make this cake in one 9 or 10-inch tube pan, but I love the idea of having two cakes out of one recipe. I served one cake the day I made it and wrapped and froze the other one. The cake should be frozen unglazed, so if you do this, be sure to cut the glaze recipe in half. Preheat oven to 325ºF. Butter and flour two 8×4-inch loaf pans, knocking out excess flour. Mix the flour, baking powder, and salt together in a bowl. Set aside. Beat the butter in the bowl of an electric mixer on medium speed for 3 minutes, until whipped looking. Slowly add the sugar and beat for another 3 minutes, increasing the speed to medium-high. The mixture should look very light and fluffy. Add the eggs one at a time, beat well after each one. Scrape down the sides of the bowl and beat again. Combine the milk with the vanilla. Add the flour in 3 portions alternately with the milk, beginning and ending with the flour. Fold the last flour addition in by hand with a rubber spatula. Turn the batter into the prepared pans. Bake for 1 to 1½ hours, checking after 55 minutes and every 5 to 10 minutes thereafter, until a toothpick inserted near the center of the cake comes out with just moist crumbs attached. If the cake is very brown after 55 minutes but not yet fully baked, cover the top with a sheet of aluminum foil. When done, the cake will be springy to the touch and pulling away from the sides of the pan. Let cool in the pan for 10 minutes, then turn out onto a wire rack to cool completely before glazing. Remember, this amount will glaze both cakes. If you are only glazing one, cut the recipe in half. Melt the butter in a heavy-bottomed saucepan over low heat, then add the brown sugar and raise the heat to medium. Boil, stirring constantly, for 2 minutes. Add the milk and return to a boil, stirring constantly. Remove from heat and stir in the salt and vanilla. Let cool for 10 minutes. Sift 1 cup of the confectioners’ sugar over the mixture, stirring with a whisk until smooth. If the glaze is thick enough for your liking, you can stop there. If not, sift the additional ½ cup sugar in. Place the cake (still on the wire rack) over a wax paper lined baking sheet. Pour the glaze over the cooled cake and allow it to drip down the sides. Allow the glaze to set completely before slicing and serving. Wrapped carefully, this cake will keep for several days at room temperature. If you happen to have some homemade caramel sauce on hand, it is amazing poured over top. I love reading memoirs so this is so going on my library list! And it looks amazing. The glaze!! The glaze!! Yum! The cake and glaze look absolutely luscious. Does the play happen to deal with addiction at all? I am looking for a play that deals with addiction issues for a collaboration between a theater I work with and another non-profit. i’m all over that glaze. it’s so time for me to make a cake. this is the 3rd cake i’ve seen in the last 20 minutes. i’m dying here. This looks fabulous and yet includes things that I have on hand at all times! I love having go-to recipes for last minute desserts – so thank you! This looks absolutely amazing. This is the type of cake picture that makes me squeal. luscious! That looks incredibly good. I love that frosting. I should try it. This looks and sounds reallllllly good! I love Cooking for Mr. Latte – one of my favorite books! This is so right and so wrong in so many ways – YUM, looks AMAZING!! Oh my! How could this not be wonderful. Buttter, brown sugar, vanilla. Then more butter, brown sugar and vanilla for the icing. I am trying to cut back at the moment, and this recipe isn’t helping a bit! I suppose because I’m the one who gave you the book I have a moral obligation to make this cake. p.s. By the way, I am really impressed by the frequency of your posts, Dana. I seriously don’t know how you keep up the pace. Hi! I’d really love to make this, but I can’t see how many eggs to use. Can you please let me know? Thanks! I read lots of blogs and admire the pretty pictures. Your blog today made my tummy rumble. I would have loved just a little nibble of that fabulous looking pound cake with my morning coffee. I can imagine how delicious it is! 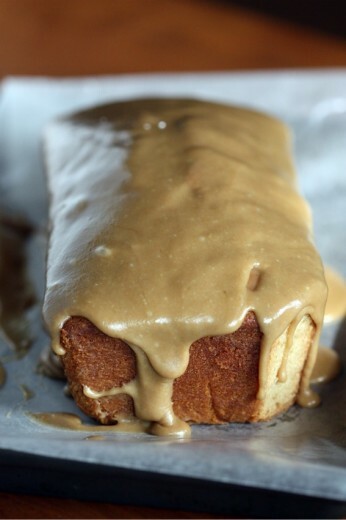 Simple cakes are the best….the glaze looks wonderful, Dana. Too funny, I just pulled Mr. Latte out the other day! I too love to bake, some days it is more of a need to bake than anything, and I always feel the better for it. Sorry about that Susie, I fixed the recipe. That looks amazing! Can’t wait to try the recipe out! that glaze looks tantalizing. I do love an easy cake too, and, of course, I totally know what you mean about baking just to bake. Looking forward to the other recipes from your party! Thanks so much, I can’t wait to make this! I love the idea of a dessert party…my favorite kind! Truly, though, you had me at brown sugar. I love it’s sultry flavor and how it’s not really as raw as white sugar. And I am absolutely positive I’d adore this cake. OMG ! Now I know why this cake is to die for : 3 cubes of butter and 3 cups of sugar. But, you know what? Sooo worth it! Am planning to make after Passover ! Wow that glaze dripping down looks sinfully delicious. I’m glad you cut off that corner for “testing” purposes. haven’t heard about that play here on the east coast but will be looking for it. The recipe turned out perfectly – and the cake was absolutely delicious. Just so you know, if you make a double batch of the glaze, it’s pretty spectacular drizzled over vanilla ice cream. I’ll start my diet tomorrow ;) . 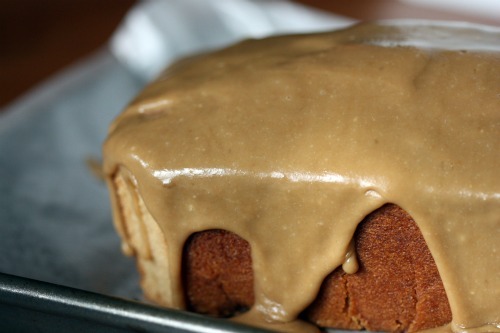 I love the sound of ‘brown sugar pound cake.’ How could that not be good? And, the glaze just looks amazing. I made the full recipe, so TWO of these beauties. ALMOST too beautiful to cut into…..almost. I LOVE having something this stunning just “sitting around” on my counter to offer company. Thanks again, times a zillion. I’ve been looking for a recipe like this for ages. It looks delicious. Okay, I had to make this since it only required few ingredients and looked very easy. I did make a minor change. Instead of whole milk I used soy milk. Oh my, it was delicious! I made one in a 8×4 inch loaf pan and the other I used two mini loaf pans. One of the mini loaves was devoured in seconds by my family. The larger one will be given to a friend and the last mini will be gone by tomorrow! I’m with you – I love simple cakes too. And muffins. Sometimes I just have to make muffins right when I get home from work. 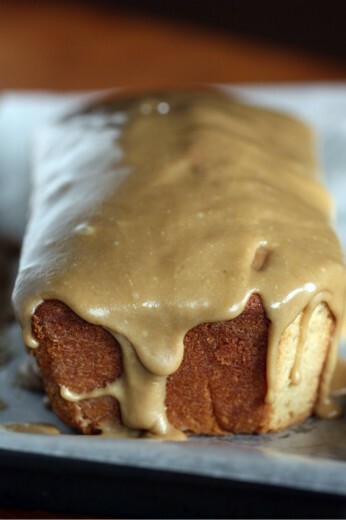 This pound cake is something I need to try. I recently made pound cake (from Baking: From My Home To Yours) and it tasted okay but was a bit dry. So I’m really curious to see how this one is. That glaze looks phenomenal. Love how thick it is. I think I may have to look into this book, Cakewalk. I think I’ve heard of it before. But, this cake also looks very yummy. I use a similar process when creating the glaze for our Butter Rum cake. I absolutely LOVE using brown sugar when baking! I just made this cake for the first time and froze it for a party on Saturday. I’ve never frozen a pound cake before and I’m wondering the best way to thaw it. Should I take it out on Friday night and leave it a room temperature, uncovered? I’m planning to make the glaze on Saturday morning. Any defrosting tips would be greatly appreciated! I’m really excited to taste it – it was easy to make and looked beautiful out of the Bundt pan. I’ve made a similar cake for years which uses plain yogurt for the milk and one-third cup of poppy seeds. The glaze will be perfect with it. Dana, I made this cake for my son’s 21st birthday on 1/5. It was easy, and it was a huge hit. I made it in a tube pan (not splitting it into loaves). I slightly messed up on the glaze though because I glazed it when it was already on the cake dish (but nobody cared because they were all boys …). I know, I didn’t follow your directions about that part. However, I did have a question – how do you transfer it from the rack to the serving dish once it’s been glazed? I think this pound cake was probably as good as another pound cake I make – the Elvis one which takes 2 times more effort than this one. Dana, just finished baking this wonderful recipe it was so easy to prepare that my three year old nephew helped me. I love the sugary crust and buttery texture. Happy Holidays and Happy New Year!! !